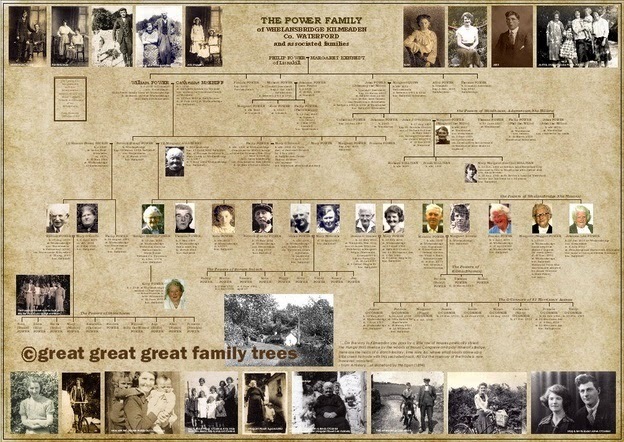 Waterford-based Tony Hennessy, a member of the Association of Professional Genealogists in Ireland (APGI), has launched a new website – www.greatgreatgreatfamilytrees.com – to promote his customised image-rich family tree charts. The tree charts are eye-catching and dramatic representations of a family history and can include any number of ancestors to reflect the degree of research completed. Tony told Irish Genealogy News that such charts explain a family 'at a glance'. "They are often commissioned as presentation gifts — an example would be the tree chart presented to the Mayor of Boston, Marty J Walsh, only last month, which I created following a joint research collaboration with my APGI colleague John Grenham. There's certainly a WOW! factor when a chart is presented to a non-genealogist." But charts are just as likely to be commissioned by a family historian who wants to put their research into a cohesive format, one that can be sent on to other family members who perhaps are not genealogists. "For many such researchers, the tree chart brings them a sense of relief that their life's work is saved in a form that others can readily understand. For many families, sharing the tree opens up a wider conversation about their ancestors and all kinds of additional details can be rediscovered, either in their memories or in their lofts." 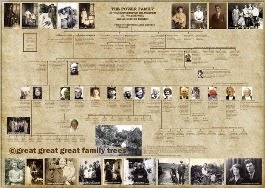 Because each chart is unique, there is no one-size-fits-all price for these personalised family trees. As a ready reckoner for a basic chart, you can work on around €8 per name and €8 per photo. You'll find more details and some good examples of previously completed work, on the new website. Or you can speak to the man himself, in between consultations at the APGI stand, at the Back To Our Past show at the RDS this weekend.